On April 30- May 1st. 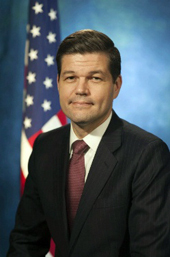 the Assistant Secretary at the Bureau of European and Eurasian Affairs Aaron Wess Mitchell is visiting Georgia and provides a keynote address at the NATO-Georgia public diplomacy forum to be held in Tbilisi. The main purpose of Mitchell’s visit is to reinforce U.S. support for Georgia’s aspirations to integrate into Euro-Atlantic institutions. During his visit he will meet with the authorities of the Georgian government, representatives of civil society and the American Chamber of Commerce. Before the visit, Mitchell held a phone conversation with the Prime Minister Giorgi Kvirikashvili, during which Mitchell called Georgia the regional leader in reforms, he also discussed possible ways of deepening the US-Georgia defense cooperation, Georgia’s Euro-Atlantic aspiration and the US role in the consolidation of support for Georgia ahead of the upcoming NATO Summit which will be held on July 11-12 in Brussels,. NATO Secretary General announced the dates for 2018 summit and underlined the fact that NATO is going to strengthen its presence in the Black Sea region: “In response to evolving threats, NATO has implemented the biggest reinforcement of our collective defence in a generation. Our multinational battlegroups in the east of the Alliance are now fully operational and we are strengthening our presence in the Black Sea region. We are also stepping up our efforts against cyber-attacks and hybrid threats,” Stoltenberg said, this means that the importance of Georgia will be increased for NATO, therefore Georgia has big expectations from the summit. On April 26, NATO Secretary General Jens Stoltenberg held a conference, ahead of the meetings of NATO Foreign Ministers. One of the topics he discussed was Georgia’s progress towards membership: “We provide practical and political support to Georgia, we also welcome that Georgia is making progress towards membership and I'm certain that the Summit will recognize this progress. We also welcome the fact that we have many different tools to strengthen our partnership. We have the Joint Training and Evaluation Centre. We have NATO support for different other educational efforts by Georgia, to strengthen and to improve the quality of their armed forces,” Stoltenberg stated. As Stoltenberg states, Georgia's Euro-Atlantic aspirations and progress will be appreciated on the upcoming NATO summit. Georgia expects to get closer to NATO membership on each NATO summit. On the other hand, the disappointment of these expectations, has a negative effect on the public opinion, and Russia is using this factor in her information warfare, which is trying to change pro-western attitudes of Georgian society, with spreading pessimistic opinions about Georgia's opportunities to join Euro Atlantic organizations.